GREAT OCEAN VIEW (75 YARDS FROM THE BEACH)! Very Clean and Nicely Decorated, two-story, elevated house, two large covered decks with nice outdoor furnishings, ALL bedrooms have it's own bathroom and there is also a half bath off the family room, Maid Service on departure, Parking Underneath. Quick and easy walk to beach! Ocean Lakes offers a 24 hour/7 day gated community located four miles South of Myrtle Beach city limits at intersection of Highway 544 and 17 Business. Quiet Hours (11pm-7am). There are also discounts available to Myrtle Beach area shows, parks, and Golf. This is a great place for families to share many memories and start family traditions for years to come. KIDS CAMP ALL SUMMER (ages 4-12) ~ They LOVE it! We are a Family of 4 with a cat and a dog from Greenville,SC who love to visit Ocean Lakes! We have been coming since we were able to 'cruz' in a golf cart and wanted a house ever since! Here we are fulfilling a dream and we love sharing it with others! 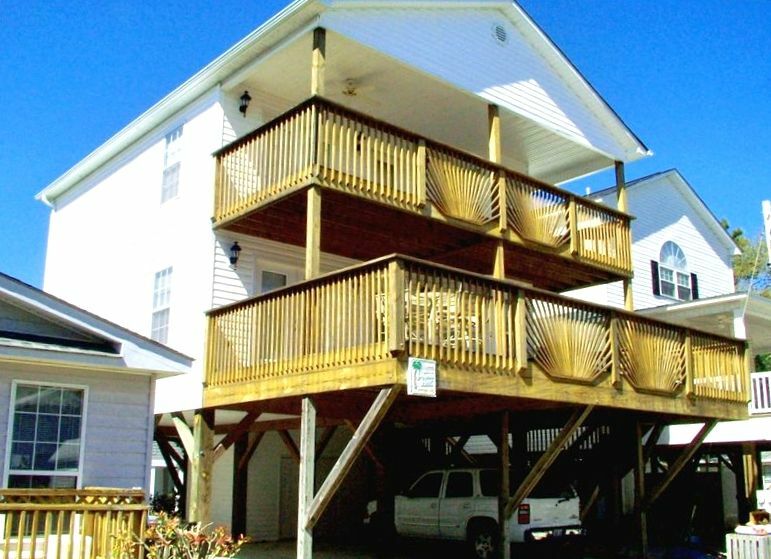 We hope you will like 'Palmetto Place' and treat it as your home away from home! Please check out our other VRBO listing 8683 located in Ocean Lakes!! Ocean Lakes is in a great location. Close to the 'strand' old Pavillion site, shopping ,golfing,mini golf,water slides,produce, flea markets and great restaurants in Murrells Inlet. Ocean Lakes does provide a gated community- a $10/day per vehicle is charged to you via Ocean Lakes to obtain car passes. paid to Ocean Lakes. We are one of the lucky ones to have an Ocean View. Most of the homes do not. We are also on a wide street which is very convenient! (3) With nice comfortable/versatile furnishings and a VIEW! NOT INCLUDED: Bath Towels,Beach Towels, Beach chairs/toys INCLUDED: Kitchen and Bed linens, Maid Service upon Departure, NO SMOKING! & NO PETS! - If this request is violated your security deposit will not be refunded! We had such a great weekend for halloweekend! Any questions or concerns I had Traci was able to accommodate from beginning to end. I had a special request of having guest over for my daughters birthday party, and she had no problem. The house is beautiful! We appreciated all her time and help, we hope you do the same!!!! My husband children and grandchildren all had great time at this property. The only thing I would change is a king bed downstairs. This home had everything we needed and was so close to the beach. I highly recommend this house and the owners were wonderful to deal with. We really enjoyed our stay. The home was clean and spacious enough for all 11 people we had. A minute walk to the beach. We will definitely stay here again! We had a great time staying in the Ocean Lakes community for spring break. We usually stay in an oceanfront hotel or condo in Myrtle Beach, but decided to mix it up this time because we were traveling with friends. The home itself needs some updates/repairs, but the owners were responsive and accommodating and the other features of the property made our stay a positive one. - This is one of the few houses I was able to find with a private bathroom for each bedroom. That was a huge advantage in my book, especially for staying with friends. - The property location is pretty good for Ocean Lakes. It's on a quieter street on the edge of the community with a limited view of the ocean and a quick walk to the beach. It's also a 15 minute walk to the pools and arcade which is reasonable if you're healthy enough. Most people use golf carts to get around. - The community has a lot of amenities and activities. The pools are nice and there is a new water park that looks fun, which was unfortunately closed for us due to being the early season. The arcade is also fun but pricey. We enjoyed playing ping-pong. There is a convenience store too but we did not visit it. - We missed having a direct ocean view. - There is some minor damage (a broken kitchen drawer, broken laundry closet door, etc.) and some of the furniture has seen it's day, and the carpet did not inspire confidence. But the owners did respond well to our requests and it seems like they try to keep it as clean as possible. I think the pictures online are a reasonably accurate representation of the real thing. - While the community provides good amenities, the house itself is purely for function. Any entertainment beyond TV will either have to come with you or be provided by Ocean Lakes. Fair trade. - Food options within the community are scarce. The fast food places by the pool seemed so-so and were quite crowded. Luckily, you have a full kitchen and there are plenty of other places to eat in Myrtle outside of Ocean Lakes. - It gets pretty crowded. It was early season for us, yet it already felt like we were packed in everywhere. It was spring break, but I expect in the summer it's much worse. There are literally teenagers in golf carts cruising around everywhere and despite the ocean still being very cold, the sun was out and so the beach was packed. - On site mini-golf isn't free and Myrtle is the mini-golf capitol of the world. Go elsewhere. We have rented this home for the last 5 years. It feels like home from home. It is perfect for the for us to rent I strongly recommed renting this home. The family that owns this home is awsome to rent from. If something isn't right they fix it right away. This is a 5 star plae. Cancellation within 90 days will receive a full refund.